The 44–cent Mother Teresa stamp. On September 5, 2010, in Washington, DC, the Postal Service™ will issue a 44–cent, Mother Teresa commemorative stamp, designed by Derry Noyes of Washington, DC. With this stamp, the U.S. Postal Service® recognizes Mother Teresa, who received the Nobel Peace Prize in 1979 for her humanitarian work. 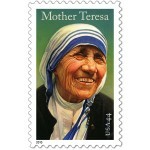 The stamp features a portait of Mother Teresa painted by award–winning artist Thomas Blackshear, II of Colorado Springs, Colorado. It is available as a Pane of 20 stamps, a Block of 10 stamps, or a Block of 4 stamps.